Glossy gatefold cover with printed banana. Back cover without Emerson and catalog number on top left. 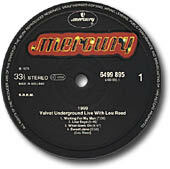 "Verve is a trademark of Metro-Goldwyn-Mayer / Printed in Holland / MARKETED BY POLYDOR" printed inside. Glossy black cover without skull, with catalog number on top right. 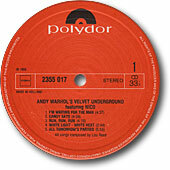 Here She Comes Now, Lou Reed guitar credit, no Warhol credit, "MANUFACTURED BY POLYDOR B.V."
Back cover reads "MARKETED BY POLYDOR" & "PRINTED IN HOLLAND" and has a big Verve Records logo just under the catalog number on top right. Black/Silver T Verve label which reads "Made in Holland". Unique alternate green/blue smoke cover. Back cover reads "Made in the Netherlands", "Manufactured and Distributed by WEA Records BV - Hilversum/Holland". 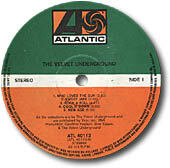 Reissue part of WEA's Original Rock Classics series. 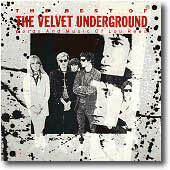 Redesigned front cover with The Velvet Underground Featuring Lou Reed. This Dutch edition came in the same sleeve as the German and French editions - back cover with late 1971 line-up photo and liner notes in English. Orange midi label. The lettering is different from the French and German editions, with STEMRA mark. Same black/white midi logo as the German edition (instead of full white on the French edition). "MADE IN HOLLAND BY NEGRAM". Dutch record in German gatefold glossy cover - catalog numbers are different on cover and records. "Herausgeber: PHONOGRAM GmbH., Hamburg / Printed in Germany by Druckhaus Maack KG, 5880 Lüdenscheid." printed on back cover. Unretouched inside gatefold picture. Neutral inner sleeves. 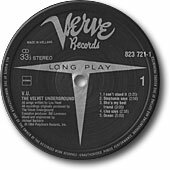 Black Mercury label. "Manufactured and Marketed by Polygram Records" printed on back cover. Kurt Loder liner inner sleeve. Grey/silver T Verve label, "MADE IN HOLLAND". 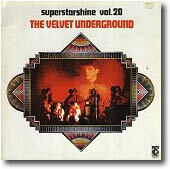 Backcover with English liner notes, photograph with Doug Yule, and ad for the Superstarshine series. Side 1 : I'm Waiting For The Man / Sunday Morning / The Black Angel's Death Song / Here She Comes Now / There She Goes Again / White Light/White Heat / Lady Godiva's Operation. Side 2 : Fairest Of The Seasons / Winter Song / Eulogy To Lenny Bruce / Beginning To See The Light / Candy Says / After Hours. 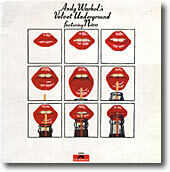 Front cover says "LOU REED" and fails to mention The Velvet Underground although all the tracks are Velvet Underground songs. 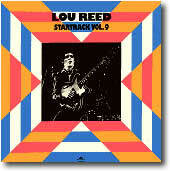 Back cover reads "LOU REED & THE VELVET UNDERGROUND" and "foto: Laurens Van Houten ontwerp Evert Jan Monroy". Black Metro label. Maureen Tucker is credited as "N. Tucker" for European Son credits. Side 1: Heroin / What Goes On / Venus In Furs / That's The Story Of My Life / Run Run Run. Side 2: Candy Says / Some Kinda Love / European Son / Jesus / I'm Set Free. Dutch edition - this record also exists as UK, French and German edition. Gatefold cover. 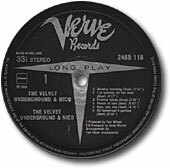 Front cover with Polydor logo at bottom. "Marketed by Polydor Printed in Holland" printed at the end of the liner notes, catalog number and Polydor logo on bottom. 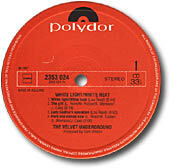 Red Polydor label with Sister Ray correctly spelled on side 3's label. Compiled by Bill Levenson. Digitally mastered by Dennis Drake and Greg Calbi from the original masters. Liner notes by Anthony DeCurtis. Photo and design consultant: Gerard Malanga. Front & back cover collage: Audrey Bernstein. Art direction: Margery Greenspan. All Tomorrow's Parties is the double-tracked vocal version, 20 seconds longer fade-out on What Goes On and 10 seconds on Waiting and Beginning. Inner sleeve with credits, photos and liner notes. 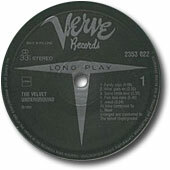 Silver T black Verve label. Side 1: I'm Waiting For The Man / Femme Fatale / Run Run Run / Heroin / All Tomorrow's Parties / I'll Be Your Mirror / White Light/White Heat / Stephanie Says. 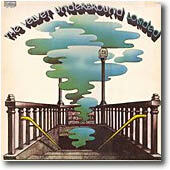 Side 2: What Goes On / Beginning To See The Light / Pale Blue Eyes / I Can't Stand It / Lisa Says / Sweet Jane / Rock And Roll. Thanks: Buck Buchanan, Jos Stikvoort, Th. Bell.